I stare at my Inbox, reading the Santiago announcement while paralyzed with disbelief. For weeks I’ve been contemplating a solo motorcycle journey to Patagonia, but have been straddling the fence. And now this. The timing is uncanny. Perfect, even. Certainly, it could only mean that the lords of two wheels had given their approval. BLUE – My trip so far. RED – My planned return route. Spreading out the maps on the floor of my Puerto Natales hotel, I examined the route that I’d taken to get here from Santiago. 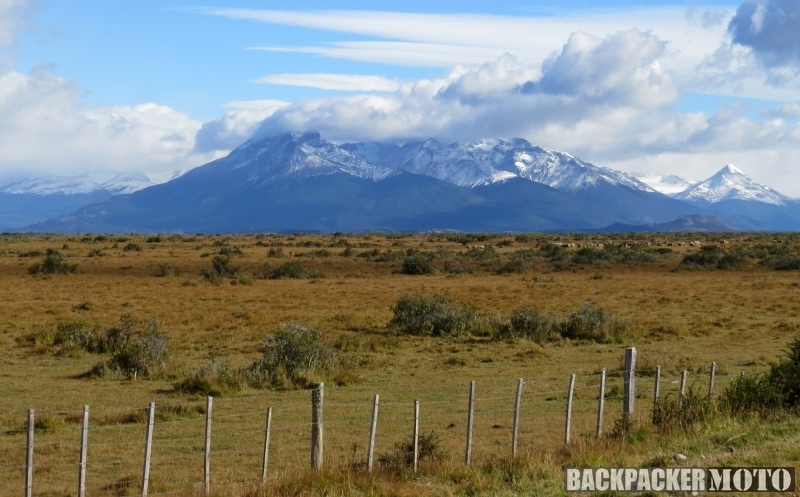 The Pan American Highway, the Carretera Austral, and Ruta 40 through Argentina. Not quite the South American holy trinity, but not a bad addition to the CV, either. 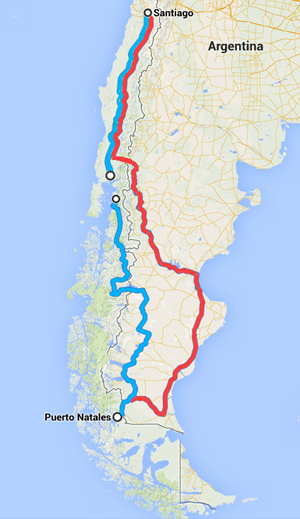 The only real plan I’d had for this adventure madness was that I would take my time getting to the south, and then in typical Backpacker Moto optimism, use the minimum number of days (minus one) to scorch my way back to Santiago. 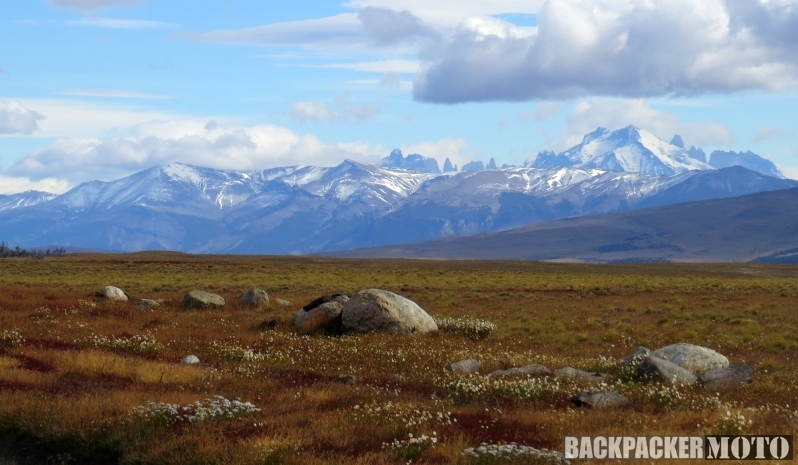 That would mean a (hopefully) entirely paved road return through some of the very remote, barren parts of Argentina. The schedule allowed for no more flexibility. In four days time, I was religiously committed to attending a spiritual gathering in Santiago, over 2000 miles away. Normally, such a distance would be an easy hop. But with two border crossings to do, unknown weather conditions, unknown roads, aboard a bike of questionable reliability with a paltry top speed of just 70 mph… I reckoned I was going to need every single minute. I loaded up and got to the task. 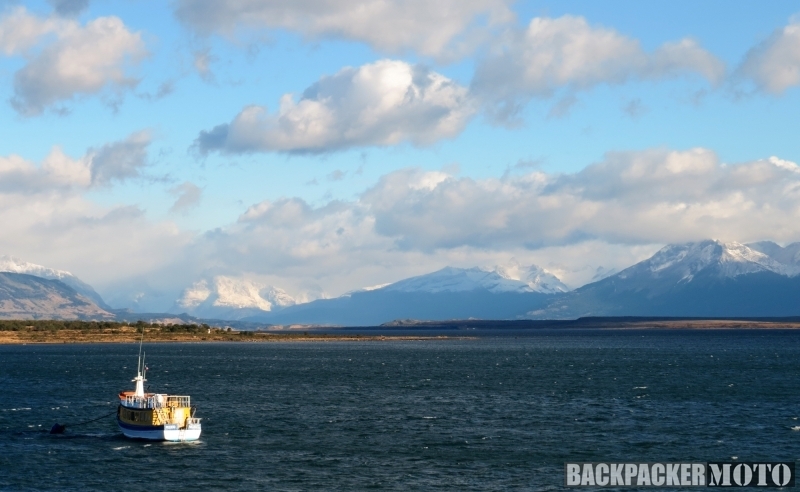 Heading out of Puerto Natales, the 80 miles of blue sky between me and Torres Del Paine were like a sneering sixth grade bully. I sneered right back. There’d be other trips. 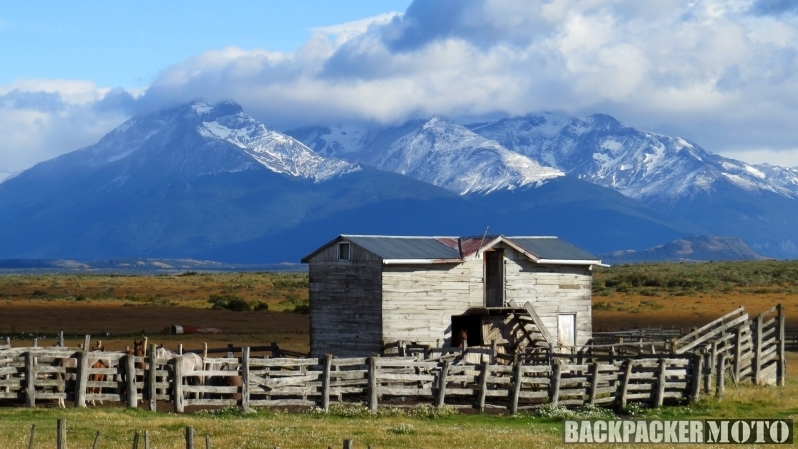 Just east of the park was Cerro Castillo, a quiet little outpost with an even quieter border crossing. 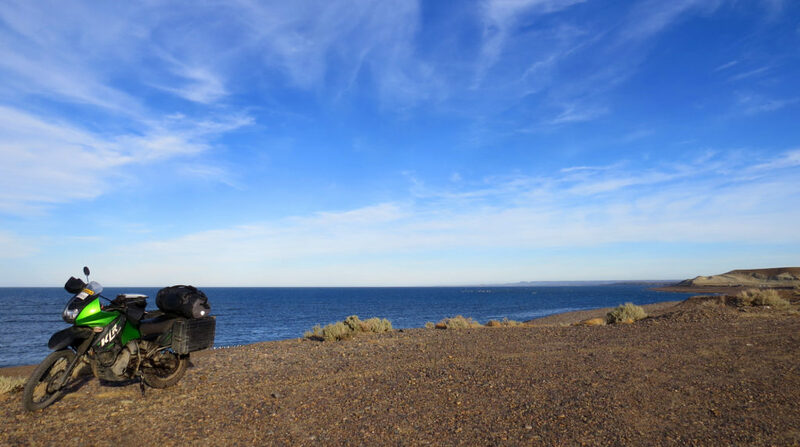 I scooted back into Argentina with no drama and then hammered down for the 230 easterly miles to Rio Gallegos on the coast. There, I found a gas/food stop on the outskirts, loaded up both bellies (the bike, mine) and immediately was rolling again. 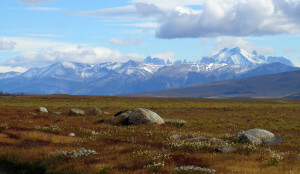 Once clear of the city, and for the first time in what seemed like ages, I wheeled the KLR to the north and headed into the sun, on the road that would take me home. And while the desire for more days is a constant of every trip, this moment felt right. It was time to start heading back. 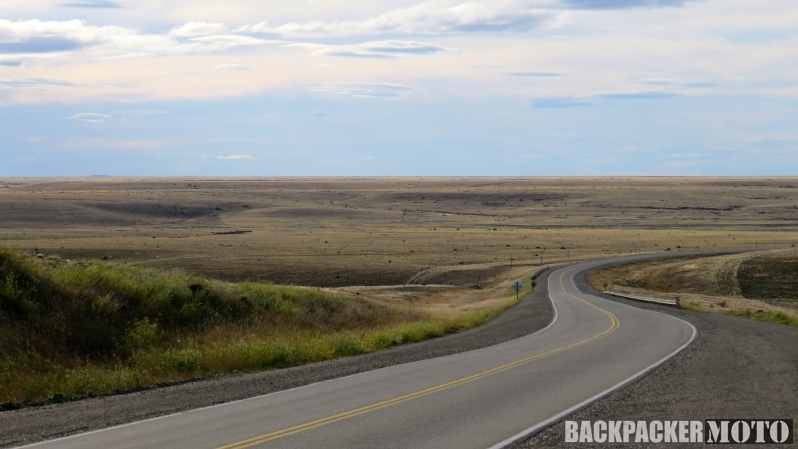 Not long thereafter, I spotted a dirt road off the main highway and was powerless to avoid it. I rode for a few miles until it came to an end. I grinned. I had awakened just a few feet away from the Pacific Ocean, ridden out of Chile and across Argentina, and now I was standing on the shores of the Atlantic, all in the span of a few hours. Morning on the Pacific, afternoon on the Atlantic. 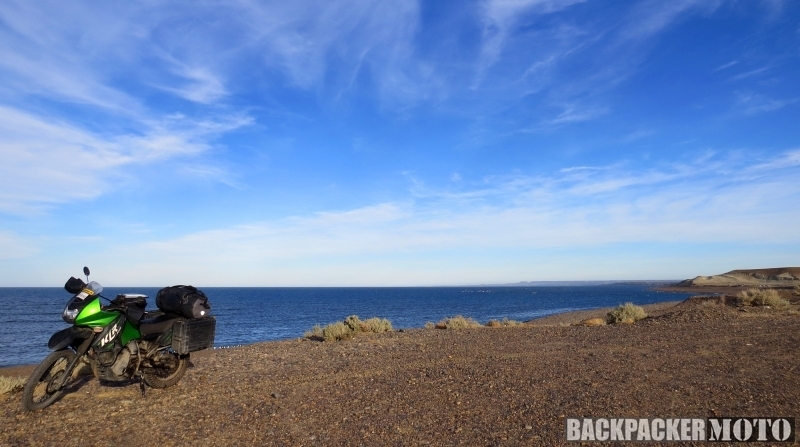 Back on the highway, I headed further north to the small oceanside town of Puerto Santa Cruz. Cruising on the main waterfront street, my eyes were immediately drawn to a shoreline indoor soccer court. 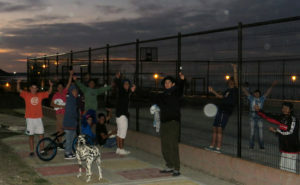 A dozen kids were playing while another half dozen or so spectated from the sidelines. I wheeled the KLR up to the court, shut it down, and the game came to a halt. The kids all gave me a cheer and came on over to check out the bike and pepper me with questions, most of which I could barely understand, my Spanish still being mostly limited to the menu at Señior Fish. The scene at the soccer court was familiar. Kids instinctively know cool, and while I would never proclaim to be as such, I do know that motorcycles are undeniably cool. Kids love ’em. Moms hate it that kids love bikes, so kids love ’em even more. It’s beautiful. It’s been this way the entire trip. Long distance motorcyclists are bona fide heroes in this part of the world, as it seems to strike a chord with the innate romanticism of Latin Americans. Since Day 1 I’ve had people hanging out windows to wave and cheer, give me thumbs up, ask for photos at gas stations, roadsides, pretty much anywhere I stop. Where I’m from, where I’m going, how long will I travel (hey amigo, we all want to know that). Whenever this “surround the moto guy” routine has played itself out, I’ve fancied myself a Pony Express rider who’s galloped into town amidst a cloud of dust, a fat sack of mail in a saddlebag, along with the latest dispatches from Fort Laramie. “What news of the war?” asks the sheriff, as I dismount to distribute the mail to a gathering crowd. I settled into the hotel directly across the street and enjoyed two of the finest aspects of the local culture. 1) Even in the smallest restaurant in the smallest town, dinner is served as late as midnight, perfect for us night owls. 2) The Argentine beef is as good as you’ve heard. I savored both conveniences, returned to my room and, in an unconscionable decision, set my alarm as I vowed to get an early start. INCREDIBLE ADVENTURES! photos are so beautiful, i wish i had the courage to go somewhere like that and see such place. kudos to you for doing it as a solo rider! Thoroughly enjoying reading about your adventure, great words and photos. The flashbacks really bring it alive and make it personal as well, thanks for sharing those memories! Riding from the Pacific to the Atlantic in a few hours, that’s truly memorable! Frohe Ostern! Fahr bitte vorsichtig. Wir wuenschen Dir weiterhin eine gute Fahrt. Schade dass Du weniger Spanisch kannst als Deutsch! Danke für die guten Wünsche, meine Freunde! Südamerikanische Fahrer sind sicherer als die Amerikaner! Weniger von ihnen! Oh, and it’s hockey playoff time! We should be watching games and eating pizza at Tony’s!